SE unveiled new additions to its campus this fall that includes additional group study and social areas for students. 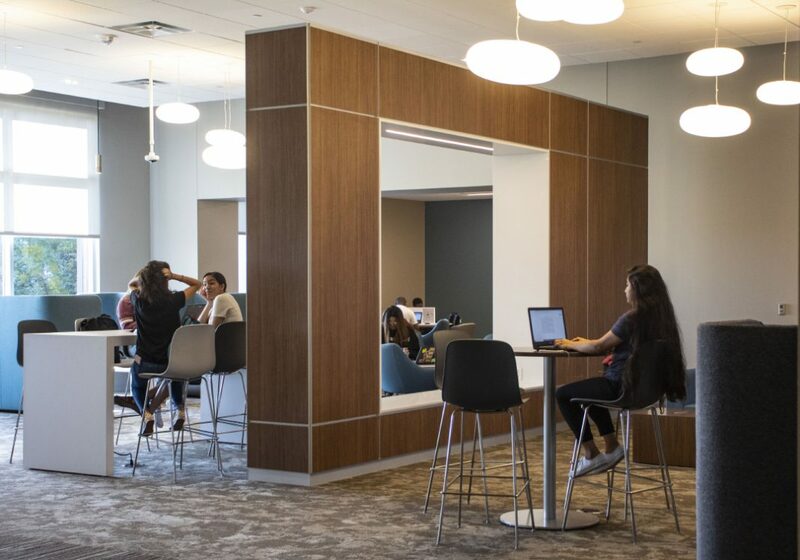 According to Cinatl, the campus was granted permission last year to add what are considered “sticky spaces”— areas where students can socialize, study and relax — to the inside and outside of the college. The learning commons is a new lounge connecting the second floors of the campus’ ESCT and ESEE buildings, he said. The new addition hovers over the campus breezeway with a designated outside break area for students that also connects the two buildings. SE’s new learning commons area is suspended above the campus’ breezeway. Both are designated areas for students to socialize or study between classes. 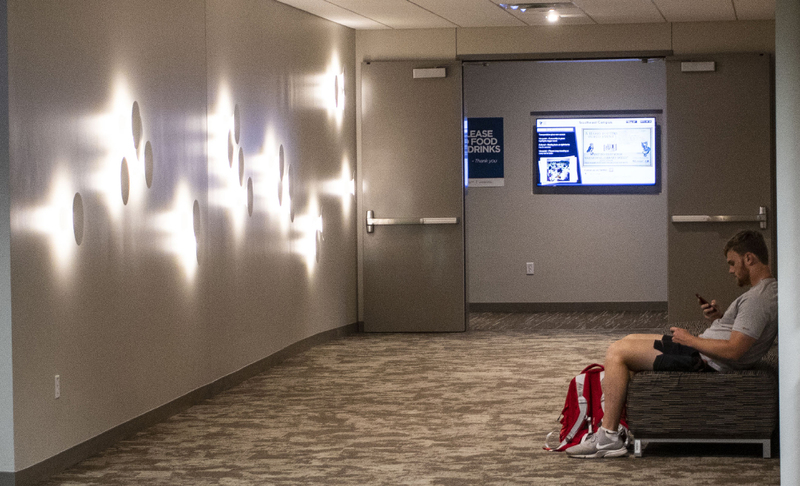 The new lounge is equipped with screens for presentations, study areas and dry erase walls, which SE student Sam Carrillo said are his favorite part of the new space. 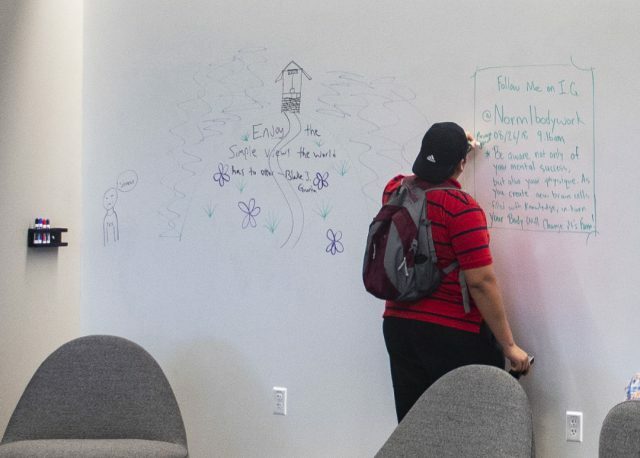 “They’re a really good way to be able to express anything you want to share with your fellow students,” Carrillo said, after writing his Instagram handle on the wall. 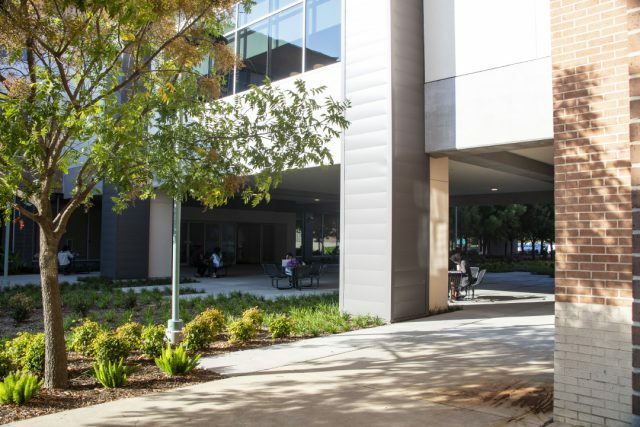 The construction of SE’s newest addition took place throughout 2017-18, which also happened to be SE student Mike Rodriguez’s first year on the campus. While the project was under construction, Rodriguez observed the space being created. “At first, I thought they were building a bridge, but when I came for my second year Monday [Aug. 20], I saw everything, and I like it,” he said, while seated in one of the cubby designated sitting areas. SE student Dylan Ford sits in the learning commons area before his morning class. As for the breezeway under the new learning commons, SE student Kristin Collier said she likes to go out there between class periods. “It is cold in the building, and people just stand around and it is so loud, so I just come out here,” Collier said. Accommodating students with more space to study and relax is only the beginning for SE Campus. Cinatl said the population of nearly 13,000 students in a campus that was built for 5,000 students is one of the reasons they’ve sought to expand. He said a new building has been discussed at board of trustees meetings, and at the Aug. 16 meeting, Cinatl said SE received approval for a new building to be built to help with the population. SE student Sam Carrillo writes on a dry erase wall in the learning commons. “But that is a number of years down the line,” he said. Despite receiving board approval, nothing is set in stone regarding the future of a new building, said SE Campus president Bill Coppola. “Through the master planning of the district, the planning, timing and priority of a facility will be determined,” Coppola said.